I cannot take any credit for these cookies, I simply made them and am reporting on my success. Two days ago out of the blue I was thinking how much I used to enjoy chewy molasses cookies. I think I only ever made them in the fall, and I haven't made anything similar in years, but when you get a hankering ... so I sat down and googled "almond flour molasses cookies" just to see if anything would pop up, and it did, except I didn't google "the BEST almond flour molasses cookies" and I somehow got that too. I'm telling you, these are serious YUM. 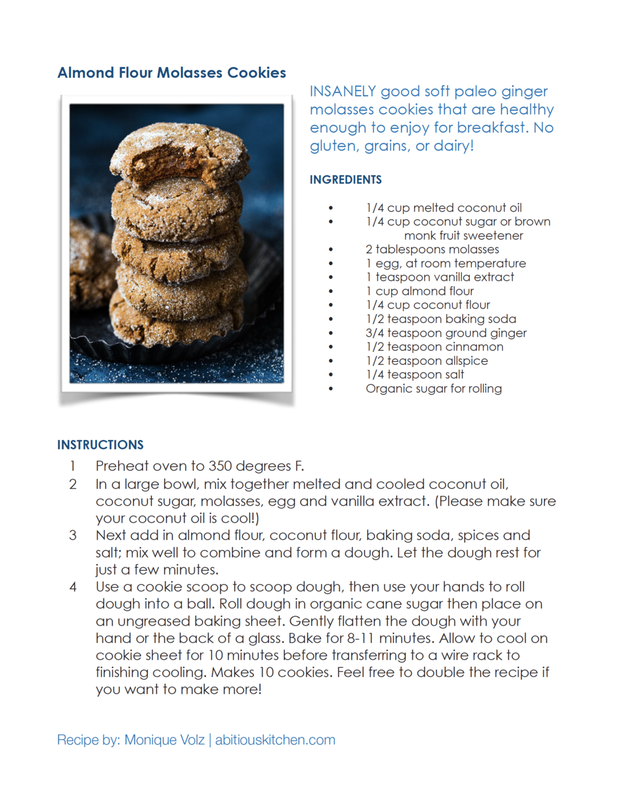 The recipe is from HERE, and it's grain and gluten free, no dairy and no refined sugar, unless of course you count those gorgeous crystals these cookies are rolled in. When I find a recipe this easy and this delicious and this healthy, then I pin it to my "Desserts I Eat" Pinterest board, but I also open a blank document and create a printable version to keep. Yes, I'm that old fashioned. I generally don't like the way recipes from blogs print out, so I make my own. You can print my PDF version here. I posted the video below for any paperless super techs out there. And can I just say that for one brief moment while making these cookies I felt like a certified Pinterest baker-girl, because I looked up and noticed the reflection of my cookies in the stainless bowl and my Thanksgiving-ish decor in the background and the scent of my pine candle wafting through the air. I thought, I've arrived! This looks 100% totally staged. I took a picture of course! Paleo Ginger Molasses Cookies get a grateful two thumbs up 👍🏻 👍🏻 from me. And, I took them to a youth activity at church and they received rave reviews from people who eat wheat flour and "regular" cookies—this by the way is a Taft term, often used as a plea, "Mom will you please make regular homemade cookies?" I’m making a concerted effort to lower my carb intake and decided to try these cookies, substituting the coconut sugar with Swerve Sweetener, Brown—which is zero-calorie and non-glycemic. I could not tell a difference. Cookies were just as DELICIOUS. I did not feel ok about NOT to updating the recipe here. Note: I still rolled them in real sugar before baking, but hey … LOWER carb! Visit Ambitious Kitchen for more delicious recipes. I know I will.